Recently, I had the great honor and privilege of interviewing Sally Muir, an artist residing in England. A selection of Sally Muir’s work is displayed below. Please visit Sally Muir’s website to view more of her wonderful work. Sally also does commissions upon request. KATHERINE CARVER: What were your beginnings as an artist and when did you realize it would become your chosen form of expression? SALLY MUIR: I have been working as a knitwear designer for many years, but have been working as a painter for about the last 10 years. SALLY MUIR: Yes. I went to art school for six years in total at the Bath School of Art. SALLY MUIR: I think that I try and keep it simple, the less is more approach is what I try and aim for – doing things succinctly. SALLY MUIR: I think it was when I realized that I really wanted to go to art school, I went as a mature student, although I had been working as a designer I wanted to study Fine as well as Applied Art. 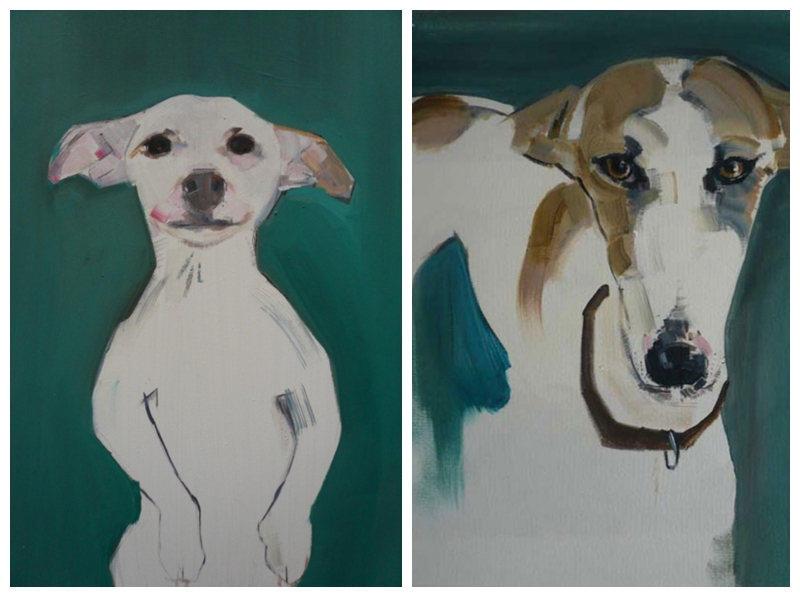 KATHERINE CARVER: What was the impetus that inspired you to begin painting dogs? 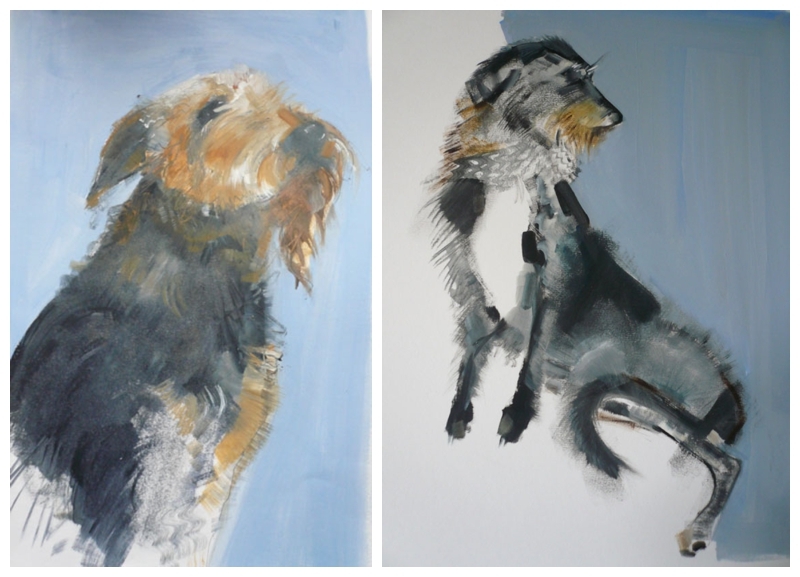 SALLY MUIR: At art school I painted my children over and over again, occasionally our dogs would appear in these paintings, and gradually the dogs took over. 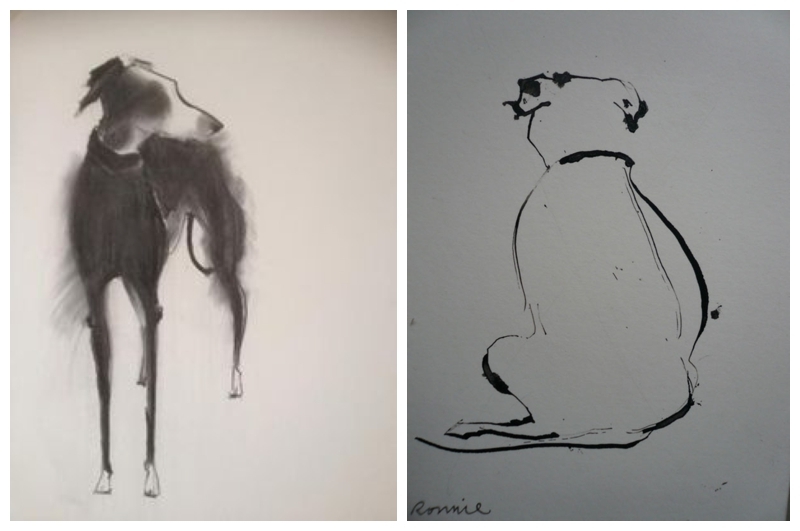 Then I began to paint and draw dogs more than people, although I do still paint people and landscapes as well, dogs have been dominating for the last few years. 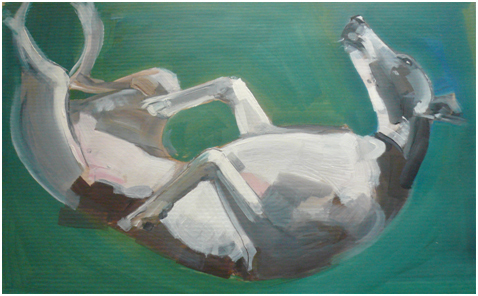 KATHERINE CARVER: Where did you get the idea to begin your interesting project entitled, A Dog A Day? SALLY MUIR: I wanted to do something with a framework and had the idea that A Dog A Day would be a way of making me get on with doing a variety of dogs and mediums, Facebook is a very simple and direct way of doing it. KATHERINE CARVER: What has been the most rewarding aspect of your project, A Dog A Day? SALLY MUIR: I love the comments that people send in and I find it very interesting which ones are more popular than others, some of the very, very simple drawings have been more popular than the more detailed ones. People are very generous and appreciative on Facebook – I think they may filter out the negative comments, as people are generally very enthusiastic. The other very rewarding thing is just how devoted people are to their dogs. SALLY MUIR: Very much — over the years I’ve had 5 dogs and they feature quite a lot, I’ve now got 2 Whippets who are beautiful sculptural dogs, and spend their whole lives posing however they lie, they always form lovely shapes. But I also love hairy dogs. 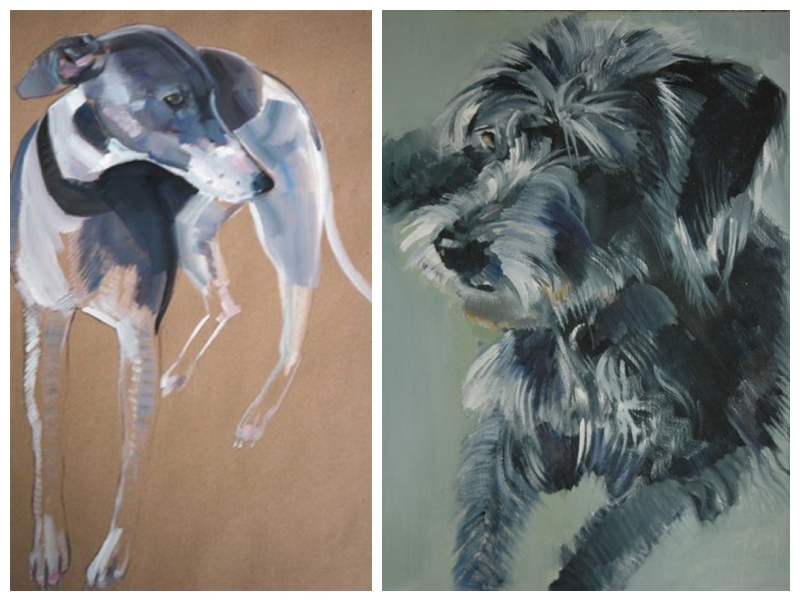 SALLY MUIR: I show regularly in a gallery in Stockbridge in Hampshire called Dogs in Art, and I’ve just had a show in Anthropologie in the King’s Road in London which has been a great opportunity for me to get seen by lots of people. I also take part in group shows all around the place. SALLY MUIR: Being creative means two completely different areas for me, either knitting or designing. My business partner Joanna Osborne and I write knitting books, Best in Show Knit Your Own Dog and Best in Show Knit Your Own Cat and our latest one Knit Your Own Zoo is just out, so we spend a lot of time creating the patterns for those as well as our own knitwear collection under the label Muir and Osborne. The rest of my time is spent on painting and drawing, trying out different ideas and materials. Pursuing different alleys, some of them leading somewhere, some of them blind. SALLY MUIR: Trying to make a living out of it. 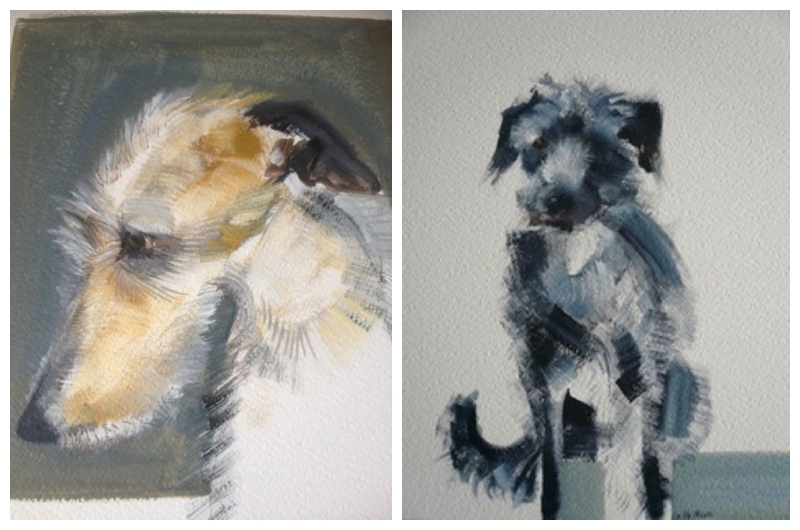 SALLY MUIR: There are always new dogs to paint; and new people to paint. KATHERINE CARVER: What is the most rewarding and satisfying part about being an artist and creating art? SALLY MUIR: I do a lot of commissions and it’s a great feeling when you’ve done something you’re pleased with and the person who has commissioned it really loves it. SALLY MUIR: Radio 4 mainly, I don’t really have any other rituals. KATHERINE CARVER: Looking back on your accomplishments, to date, what are you the most proud of? SALLY MUIR: I think winning the Holburne Portrait Prize, I’ve never been so surprised in my life as when my name was read out, I’m one of those people who never win things, I’ve never won a raffle prize or anything before. 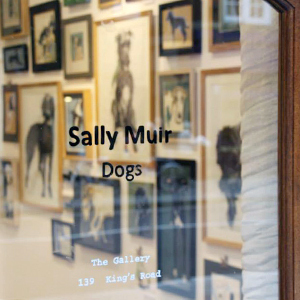 SALLY MUIR: I’m still working on A Dog A Day and I have a lot of commissions which have come through that as well as Dogs in Art and Anthropologie. SALLY MUIR: I love Masaccio, Velasquez, Michael Andrews, William Nicholson, Joan Eardley, and I’ve just seen the Peter Doig exhibition in Edinburgh, which was brilliant. KATHERINE CARVER: What piece(s) of artwork is your favorite? SALLY MUIR: There is a painting in the National Portrait Gallery of Max Beerbohm by William Nicholson which I love, whenever I’m there I’m tempted to wrench it off the wall. It’s a brilliant example of less is more. SALLY MUIR: I suppose just do what you’re most interested in. 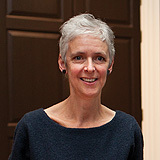 KATHERINE CARVER: How can people view, commission, and purchase your art works? SALLY MUIR: Through my website is easiest it’s www.sallymuir.co.uk or you can have a look at A Dog A Day on Facebook and if you’re interested in knitwear or knitted dogs/cats/zoo animals www.muirandosborne.co.uk. All images are courtesy of Sally Muir. I enjoyed this interview and liked her style of work.